You are all familiar with the Beatitudes from Matthew chapter 5. I want to especially draw your attention to Matthew 5:4, which in the King James reads, "Blessed are they that mourn: for they shall be comforted." The Holman Christian Standard version captures more of the power of this verse when it uses the word because instead of the word for. It reads, "Blessed are those who mourn, because they will be comforted." In other words, those of us who mourn are blessed. We are blessed because we are going to have the privilege of experiencing divine comfort, comfort from God himself. But to really capture the sense of the power of this verse, I turn to Dr. Eugene Peterson's paraphrase called "The Message." There the verse reads like this, "You're blessed when you feel you've lost what is most dear to you. Only then can you be embraced by the one most dear to you." When I heard those words read, "only then can you be embraced by the one most dear to you," they were burned into my heart and soul. I knew this was what I needed, the embrace of God. My mind was immediately drawn to the things I most missed about Stephen. One was those long rides to Mount Juliet where Steve played hockey and those long conversations. And on the way back we often stopped at Snow White, Wendys, or Burger King. There we would eat those delightful, wonderful bad things: hot dogs, french fries, burgers, etc. Somewhere during the trip Steve always thanked me for taking him to hockey, and he thanked me for treating him after the game, even if it was just for a drink. It was tremendous comfort to me to have a son who was a great friend and companion. But it was also very satisfying to have a son who was grateful. As Stephen got older he wasn't much of a hugger, except when he was being silly, but in his own way, he reached out and embraced me by being a delightful companion. As I thought about Steve, now in heaven, I prayed, "Lord, would you be willing to take Steve's place. Would you be my friend and companion, the way Steve was?" I wanted to experience the embrace of God. There are many ways in which God embraces us. Often God embraces us through his word. Many of us can recall times when the Word of God seemed to lift off the pages and burn its image into our hearts and souls. One such time occurred when I was a young boy in what is now called the pre-teens. I was all by myself in a quiet room reading from John chapter 14. John 14:1-3 almost seemed to come alive, "Do not let your hearts be troubled. Trust in God; trust also in me. In my Father's house are many rooms; if it were not so, I would have told you. I am going there to prepare a place for you. And if I go and prepare a place for you, I will come back and take you to be with me, that you also may be where I am." Then in John 14:27 I read, "Peace I leave with you; my peace I give you, I do not give to you as the world gives. Do not let your hearts be troubled and do not be afraid." Just as those verses provided great comfort to a pre-teen boy, they assure great comfort to me now. Also, just like then, these verses have to be seen and understood through the eyes of faith, a faith grounded in the assurance of the character of the living God. In Hartsville Park a wreath marks the spot of Steve's fatal crash. There it would be all too easy to fall into the folly of the "what-ifs." What if I had been more diligent to make sure that Steve was safe? What if Steve had been more diligent in looking out for his own safety? What if I had forbidden BMX biking? What if I had studied my son's hobby so that I would be more aware of the dangers? What if I had just given him a mound of dirt at home? At home he would have crashed on dirt, not asphalt. The list goes on. There is a kind of peace that the world gives. If you do everything the world's way, or if you just avoid making dumb mistakes, the world will let you have its kind of peace. You get peace by earning it, by being entitled to it. As I stood before that wreath I knew that I was not entitled to peace. I had blown it. But then there's that peace that God gives, where he sees our fallen nature, our errors, our mistakes, our bad judgment, and in spite of all this he says, "Peace I leave with you; my peace I give you. I do not give to you as the world gives." As I read those words, I considered that God's will was not thwarted by my dumb mistakes. Indeed I knew from Psalm 139:16 and from Job 14:5 that Steve's days were numbered before he was even born. When I considered this and when I accepted it, I experienced the embrace of God through his word. 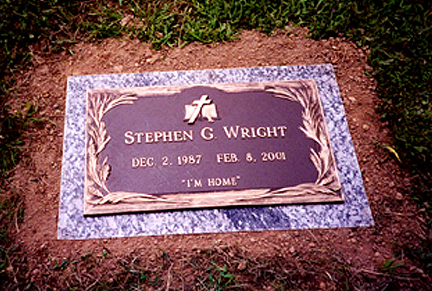 From the park, if you climb a few fences, avoid a few cows, and scale a steep hill -- perhaps it's easier to just drive there -- you come to the place where Steve's body lies buried. One year for Christmas Steve asked that we order him a truckload of dirt. "Sure son, would you like this gift wrapped?" Since we never did honor that request, now it seems ironic that we all saw his body buried under a truckload of dirt. From what we could see with our eyes and touch with our hands, it ended there, buried in a heavy oak box: love gone, compassion gone, enthusiasm and zest for life all gone, the meaningless terminating point of existential despair. He loved; he cared; so what, now he's gone. But Jesus says in John 14:1, "Do not let your hearts be troubled. Trust in God; trust also in me." Did I really trust God? Did I really believe in the resurrection? I have always taken these beliefs for granted. But as God refined my faith by calling these beliefs into action, I experienced the embrace of God. If you leave the cemetery and travel back to our house on Harris Branch Road where Steve lived, and if you look up past the barn, you can see the fire tower. I think the first time that Steve and I climbed to the tower we still had snow on the ground. As we climbed Steve would periodically stop to take in the great views. This life, this land, what a pity that he would only live there for a year and a half. But Jesus says in John 14:2, "In my Father's house are many rooms; if it were not so, I would have told you. I am going there to prepare a place for you." In other words, Steve is in a different place, a better place. As much as I love these hills, and as much as Steve, Nan, and I enjoyed our life here, what is this compared to heaven? What is this compared to paradise, something that now we can perceive only through the eyes of faith. Scriptures don't tell us a lot about heaven except that it's beyond what we can imagine. There are delights in heaven that have no comparison on earth. But sometimes this kind of comfort doesn't help. Sometimes I would say, "Dear God, I knows he's safe but, don't you understand, I miss him, and it's driving me nuts." Even to this, Jesus has the answer. In John 14:28 Jesus said this to his disciples, "You heard me say, "I am going away and I am coming back to you.' If you loved me you would be glad that I am going to the father, for the Father is greater than I." This verse threw me when I reread it. Would I hold Steve back from heaven? Do I love him enough to let him go? I guess that part's easy. Nobody asked me. No one asked me to sign a permission slip to let Steve go on to heaven. But then, why should they. Nan and I understood early on that parenting is just a stewardship, that is, our children don't belong to us. However, somewhere along the line Steve became mine. He became my son, rather than God's temporary gift. God only took what was his. Similarly, when Lazarus died, God only took what was his. Do you remember the story of Lazarus? Do you remember how Lazarus got sick and died before Jesus got to his house. Jesus knew a secret. He knew that he was going to raise Lazarus from the dead. But something happened to Jesus when Jesus saw the people weeping for Lazarus. Jesus wept. He wept loudly. In fact, the people were so impressed with the way he wept that they said things like, "see how much he loved him." Friends I don't believe he was weeping for Lazarus. He was weeping for those people, and he was weeping for us. He fully understands our grief and our sorrows. Indeed, I believe it strengthened his determination to face the cross that lay ahead of him, knowing that because of what would happen there, some day this cycle of death would end forever. But we live in the present, not the future. We need present-tense grace. We need, in the present, to experience the embrace of God. Sometimes God graciously gives us a sense of his presence that we can physically feel. I am very grateful for moments like that. However those moments never last, and it would be folly to put our confidence in our feelings. But the word of God lasts forever. That is where we need to look to find the embrace of God, God's Word enlightened to us by The Holy Spirit. Thanks be to God for his son Jesus Christ, who understands our griefs and our sorrows, who covers us with his tender mercies, and who embraces us as a faithful friend.